Vancouver, Aug. 9, 2016 | UrtheCast Corp. (TSX:UR) (“UrtheCast” or the “Company”) today announces financial results for the three and six months ended on June 30, 2016. The Company is pleased to report Q2 non-IFRS revenues of $15.9 million (IFRS – $21.0 million), a 218% increase over Q2 2015 non-IFRS revenue of $5.0 million (IFRS $5.0 million). The Company’s non-IFRS adjusted EBITDA was positive $5.0 million in the quarter compared to a loss of $1.8 million in 2015. Non-IFRS earth observation imagery revenue increased by approximately 130% from Q1 of fiscal 2016, growing from $1.3 million to $3.1 million. Non-IFRS engineering and value added services revenue also increased at the same rate from Q1 of fiscal 2016, growing from $5.5 million to $12.8 million. 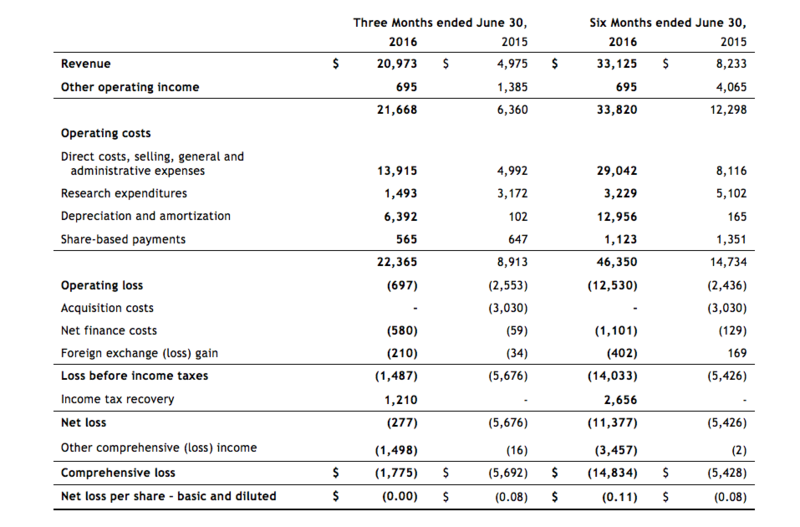 At June 30, 2016, the Company had total cash balances of$31.4 million and working capital of $28.4 million. This continued significant year over year growth allows us to reaffirm our full year 2016 guidance to achieve non-IFRS revenue between$55 million and $60 million (representing an IFRS revenue range of $78 million to $83 million) and non-IFRS adjusted EBITDA guidance between $4.2 million and $6.2 million in fiscal 2016. The Company announced a strategic partnership with OmniEarth, Inc. (“OmniEarth”) in support of UrtheCast’s planned UrtheDaily™ Constellation, expected to be capable of imaging the global landmass every day at 5 meters GSD. The UrtheCast-OmniEarth partnership includes collaborative system development, the sharing of intellectual property, and joint customer marketing activities. Based in Arlington, Virginia, OmniEarth is a leading data analytics company and a large consumer of Earth imagery. OmniEarth specializes in image processing, data fusion, and predictive analytics, in essence turning big data into actionable intelligence. One of OmniEarth’s leading products is a tool for water utilities that estimates water demand, but the company has also served the energy industry, the agricultural sector, and the U.S. Federal Government. UrtheCast will receive $5.0 million from the Government of Canada’s Technology Development Program (“TDP”), as part of a $54 million contribution program for the development of new satellite technologies. UrtheCast’s contract for the $5.0 million portion of the TDP award is scheduled to be paid out evenly over five years on a reimbursement basis as eligible costs are incurred. UrtheCast issued a Request for Proposal (“RFP”) to U.S. companies interested in a long-term strategic partnership to serve the United States Government, further to the Company’s announcement on May 6, 2016. The RFP solicits prospective U.S. commercial partners with strong U.S. Department of Defense and Intelligence Community footprints to help deliver data and services from UrtheCast’s planned 8-satellite UrtheDaily™ Constellation and 16-satellite OptiSAR™ Constellation to U.S. Government user agencies. Technically, significant progress has been made on the dual band, multi-aperture SAR-XL payload and the high-resolution optical dual mode camera with both completing their preliminary design reviews. Also, at the OptiSAR mission level, the Mission Requirements Review was completed and the spacecraft is now under full development. Starting in April we began delivering Deimos-1 imagery of the entire contiguous US – cloud-free – to the platform on a monthly basis. This complements an already existing 5–year archive of contiguous U.S. imagery on the platform. UrtheCast’s Deimos-2 data has been incorporated into the UrthePlatform’s offerings, beginning with imagery from the San Francisco Bay Area, with additional Deimos-2 data of other areas expected to be added in the future. UrtheCast expects to soon make Sentinel-2 data, from the European Space Agency’s Copernicus Programme, available for UrthePlatform users. 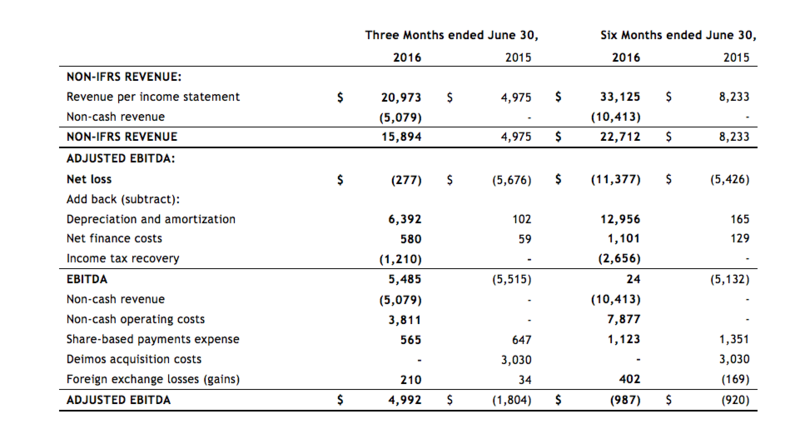 The following table provides selected financial information of the Company, which was derived from, and should be read in conjunction with, the unaudited consolidated financial statements for the three and six months ended June 30, 2016. As previously announced, UrtheCast will host a conference call regarding its 2016 first quarter financial results at 5:00 p.m. ET (2:00 p.m. PT) today, August 9, 2016. The live conference call will be available by calling toll-free at +1 866-696-5910, or by toll call at +1 416-340-2217. The participant pass code is 4686716. An archived version of the conference call will be made available on the Company’s investor website (investors.urthecast.com) following the live conference call. UrtheCast Corp. is a Vancouver-based technology company that serves the rapidly evolving geospatial and geoanalytics markets with a wide range of information-rich products and services. The Company currently operates four Earth Observation sensors in space, including two cameras aboard the International Space Station and two satellites, Deimos-1 and Deimos-2. Imagery and video data captured by these sensors is downlinked to ground stations across the planet and displayed on the UrthePlatform, or distributed directly to partners and customers. UrtheCast is also developing and anticipates launching the world’s first fully-integrated constellation of multispectral optical and SAR satellites, called OptiSAR™, in addition to its proposed UrtheDaily™ constellation, which the Company believes will together revolutionize monitoring of our planet with high-quality, medium and high-resolution, and high-coverage and high-revisit imagery in all weather conditions, any time of day. Common shares of UrtheCast trade on the Toronto Stock Exchange as ticker ‘UR’. For more information, visit UrtheCast’s website at www.urthecast.com. The Company prepares its financial statements in accordance with International Financial Reporting Standards (“IFRS”), as issued by the International Accounting Standards Board. This release includes certain non-IFRS financial measures, such as non-IFRS revenues, EBITDA and adjusted EBITDA. The Company uses these non-IFRS financial measures as supplemental indicators of its operating performance and financial position. These measures do not have any standardized meanings prescribed by IFRS and therefore are unlikely to be comparable to the calculation of similar measures used by other companies, and should not be viewed as alternatives to measures of financial performance calculated in accordance with IFRS or considered in isolation or as a substitute for measures of performance prepared in accordance with IFRS. These non-IFRS financial measures should be read in conjunction with the Company’s financial statements and accompanying MD&A. This release contains certain information which, as presented, constitutes “forward-looking information” or “forward-oriented financial information” within the meaning of applicable Canadian securities laws. Forward-looking information involves statements that relate to future events and often addresses expected future business and financial performance, containing words such as “anticipate”, “believe”, “plan”, “estimate”, “expect” and “guidance”, statements that an action or event “may”, “might”, “could” or “will” be taken or occur, or other similar expressions and includes, but is not limited to, statements relating to: UrtheCast’s expectations with respect its current sensors and proposed OptiSAR™ and UrtheDailyTM constellations; financial guidance for the 2016 financial year; anticipated cash and financing needs; its plans for and timing of expansion of its product offering and value-added services, including providing additional data sources on the UrthePlatform; its future growth and operations plans, including with respect to the RFP; expectations regarding its sales funnel; and anticipated trends and challenges in its business and the markets in which it operates. Such statements reflect UrtheCast’s current views with respect to future events. Such statements are necessarily based upon a number of estimates and assumptions that, while considered reasonable by UrtheCast, are inherently subject to significant uncertainties and contingencies. Many factors could cause UrtheCast’s actual results, performance or achievements to be materially different from any future results, performance, or achievements that may be expressed or implied by such forward-looking statements, including, among others: any delays or failures in the design, development, construction, launch and operational commissioning of the proposed OptiSAR™ orUrtheDailyTM constellations; the Company being unable to convert the Memoranda of Understanding in respect of funding of the OptiSAR™ constellation into binding, definitive agreements; failures aboard the International Space Station (“ISS”) or the Deimos-1 or Deimos-2 satellites; failure to obtain, or loss of, regulatory approvals; uncertainties and assumptions in UrtheCast’s revenue forecasts; as well as those factors and assumptions discussed in UrtheCast’s annual information form dated March 29, 2016, (the “AIF”), which is available under UrtheCast’s SEDAR profile at www.sedar.com. Forward-looking information is developed based on assumptions about such risks, uncertainties and other factors set out herein, in the AIF, and as disclosed from time to time on UrtheCast’s SEDAR profile. UrtheCast undertakes no obligation to update forward-looking statements except as required by Canadian securities laws. Readers are cautioned against attributing undue certainty to forward-looking statements.